John Anthony Wright was born in Corpus Christi Texas on November 25, 1931, the adoptive son of Fred and Pauline Gilmore. When he was 10 years old he began spending weekends and summers at a large family Ranch owned by the Gallagher’s. This family became his 2nd family. His time spent with the Gallagher’s on their ranch convinced him that rural life was what he wanted and needed. It was this attraction to rural life that eventually brought him to Wyoming. 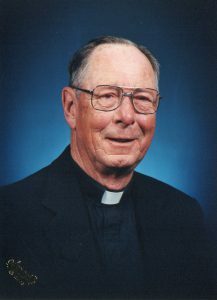 In 1951 he entered the Benedictine Monastery of Subiaco Abbey in Subiaco Arkansas and was ordained a priest on May 26, 1956. He then went to St Louis University and received his degrees in Mathematics and Secondary School Administration. 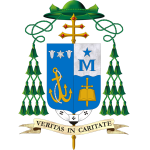 On December 17, 1960, he was appointed principal of Corpus Christi Academy, the very school he attended as a child. He was a math and physics teacher, as well as a bus driver at the Academy. In 1968, he left the Benedictines and became a diocesan priest for the Diocese of Cheyenne. He was stationed at the Cathedral in Cheyenne and St Laurence O’Toole in Laramie. He was the pastor of St Anthony’s, Upton; Our Lady of Peace in Pinedale; Our Lady of the Mountains in Jackson; St Joseph’s in Cheyenne and St Barbara’s in Powell. After a stroke in 1998, he retired from active ministry and resided in Powell Wyoming. He was an active outdoors man, a pilot, a cowboy who loved hunting, fishing, team roping, tennis, golf, rowing a single skull, and working with horses. He was a musician, who loved to play the fiddle, the violin and the guitar. He belonged to a group that would sing for the Heartland residents, where he resided in retirement. Fr. Wright found in these last years the ability to offer his life as a priest by praying continually for others. Secondly, the last Mass he celebrated as a priest was this past Sunday, the Feast of the Ascension. On Monday morning around 1 am, he went to the hospital and died early this Saturday morning, May 23, 2015. I had a most memorable visit with Fr. Wright just this Fall. He was full of stories! May he rest in Peace! And, may his intercession be a source of more young men entering the seminary for the Diocese of Cheyenne! There will be a prayer service at 7:00pm Tuesday evening and a Mass of the Resurrection Wednesday, 10:30am at St. Barbara in Powell.